CHRISTMAS CHEER: Salang, Nanta (right), the children and others admire the Christmas tree at Rumah Michael Jantan, which was lit up to symbolize 24-hour electricity. JULAU: For the first time, some 200 residents of Rumah Michael Jantan in Nanga Bekatan, Julau, could enjoy 24-hour electricity, powered by the new micro hydro. The 10-kilowatt micro hydro is a community-based project and part of the iM Sarawak social development initiative. It has enough capacity to meet the power demands of a longhouse community previously dependent on diesel generators that cost them about RM4,000 every month. 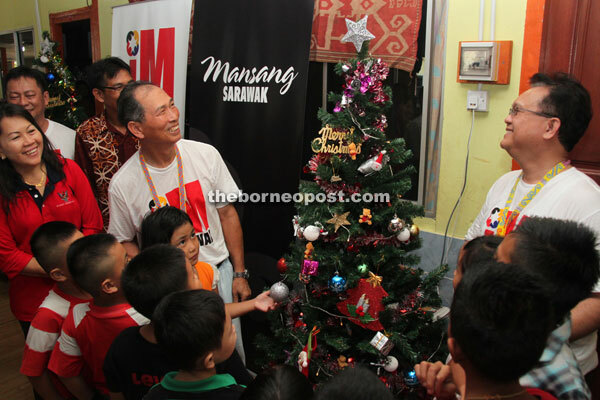 To launch the iM Sarawak Micro Hydro Dam on Friday, Julau MP Joseph Salang lit up a Christmas tree at Rumah Michael to bring Christmas cheer to the residents there. Also present to light up the tree was Deputy Minister of Rural and Regional Development Datuk Alexander Nanta Linggi. Salang, who is also the 1Malaysia Sarawak Advisory Council (1MSAC) chairman, said the project brings cheap, clean and sustainable electricity to hard-to-reach places in Sarawak. “The lighting up of the Christmas tree this year is an apt celebration for the whole community that has come together and helped in the construction of the micro hydro. “iM Sarawak promotes togetherness and the community spirit as our projects are carried out on a ‘gotong-royong’ basis,” he pointed out. Micro hydro is a ‘run-of-river’ system where flowing water is used to power the generator to produce electricity. It has relatively little impact on the surrounding ecology, as water will be diverted back into the river. Earlier, Salang and Nanta took a 15-minute walk in jungle terrain to see the dam. After the launching, Nanta called micro hydro a good project as it serves the purpose of bringing enough output, voltage, and cheaper cost through the ‘gotong-royong’ concept. “There are so many of such projects being proposed, and so many of them cost more than what it cost to build this micro hydro dam here. Many in fact actually failed to take off and some not running long enough and some useless. This micro-hydro in Rumah Michael Jantan seems to be working very well,” he said. He also said that solar power has always been one of the sources for electricity in remote areas but over the years, it has grown expensive due to heightened technology. Nevertheless, it remains as an alternative for remote areas. On the rural development programme under the National Key Result Areas (NKRA), he said there was still more to be done in Sarawak because of its vast area. “In Sarawak, there are still very large remote areas that are still not covered, so that is why we still have to turn to alternative sources for remote areas,” he pointed out. iM Sarawak projects currently cover several areas in Limbang, Julau, Sibu, Miri, Mas Gading, Santubong, Lundu and Kuching as well as in the interior such as Lusong Laku and Long Uron in Belaga, Long San in Marudi, and Long Semadoh in Lawas. These people-focused projects provide communities with clean water in schools and villages, electricity micro hydro projects, sanitation, food aid and capacity building such as skills training, assistance in agriculture ventures and youth empowerment; education through sports, and home repair. 1MSAC collaborates with relevant agencies and organisations to complement community development by the state government to serve needs of the people. The projects are carried out by Yayasan Rakyat 1Malaysia (YR1M) and Yayasan 1Malaysia Development Berhad (1MDB) in partnership with state agencies and local entities.